New truckers have many unrealistic expectations about a career in trucking. Unfortunately, many new truckers have false ideas or expectations about a career in trucking. It is because of these unrealistic expectations that many new truckers quit too soon, when they could have very successful careers. Continue reading to learn about false expectations in the trucking industry and the truth behind them. Many new truckers feel as though they must start their careers with the perfect company, and spend hours doing research. While it’s important to find a company that aligns with your wants/needs, many trucking companies are very similar. Rather than spending time researching the perfect place to start your career, all you need to look for are the types of freight they haul, the pay scale, policies on how much time you can spend at home, as well as their pet policy if you want to bring your dog along on jobs. It’s unrealistic to expect that your first trucking job is high paying and allows you to be home every night or off every weekend. Most new drivers will have to work a schedule that is not their first choice, but the experience is worth it. When you have to work on weekends and consider quitting within your first year, just remember that this experience will help you land a job at a company that works better with your schedule. There are also many unrealistic expectations about training at the start of a new career in trucking. Training is similar for all companies, but there are not any nationally recognized standards. 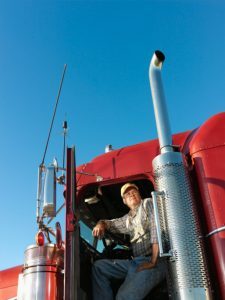 New truckers may expect training to help them be a great driver, but trucking takes a long time to get the hang of, and you are bound to make some mistakes. Many professional truckers say that it takes at least a year of driving to become proficient in their career, so don’t expect to be an amazing trucker right away. This expectation causes new drivers to quit too early, but if you stick it out and continue to improve your truck driving skills, you will soon be a professional trucker with the possibility of a great career! Evan Transportation, located in Baltimore, MD, provides trucking and transportation services for clients throughout the Mid-Atlantic region. All of our drivers and staff are offered competitive salaries, benefits, and are guaranteed to be home every day. Interested in finding out more? Visit us online or give us a call at 443-673-3365. For even more information, visit us on Facebook, Twitter, Pinterest, LinkedIn, and Google+. This entry was posted on Thursday, August 16th, 2018 at 7:58 pm	and is filed under Trucking Industry. You can follow any responses to this entry through the RSS 2.0 feed. Both comments and pings are currently closed.